Coleraine’s excellent form in 2017 has helped them close the gap on Cliftonville in third place. The Bannsiders trailed the Reds by double figures coming into the new year. 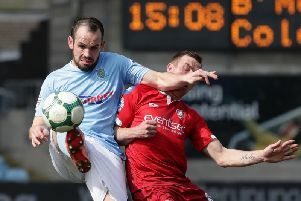 But their remarkable run of eight consecutive wins has cut the gap to only four points with Oran Kearney’s men also having a game in hand on the Solitude side. The two sides go head-to-head in north Belfast this Saturday and Kearney is determined to see his side keep their run going. “It’s a big game for us, I think there was a stage a month ago that we were 12 points behind Cliftonville and now we have reeled them right in,” the Bannsiders boss told Times Sport. “It’s in our hands possibly to try and go beyond but we aren’t looking to far ahead, we’ll just keep doing what we have been doing. “January and February have been real good months for us but we want to carry our form on. We have won eight games on the bounce and I think that’s the best in my career in my six years at Coleraine and keep saying to the lads and keep demanding it, how far do you want this run to go. “Don’t settle with five games, six games and now I don’t want them to settle with eight games, ideally we want to go to Cliftonville and then on into the Ballymena game in the cup and just keep that momentum going. “Without a doubt we have a huge few weeks coming up and obviously December it was well documented they (Ballymena) had the edge on us in the two games. “But I think performance wise on Boxing Day we left a mark in that if we had taken our chances we could have possibly scored three or four, but we didn’t and got punished, rightfully so, but I don’t think there’s a huge amount between the two sides and to be honest I think it will come down to who has the most mental strength on the day. The Bannsiders will be without the services of suspended duo James McLaughlin and Ciaron Harkin this Saturday. “I remind Ciaron after each and every game that the Premiership isn’t easy,” said Kearney. “I also told him that when Lyndon (Kane) made his debut at 17, we won four on the bounce and again then it was the same jokes about this league is easy, but to be fair I was in Ciaron’s ear, especially after our fourth win that, Lyndon had done that the same, so I was glad that Ciaron was in the side which defeated Dungannon and got us over the line.